Single or taken, there's something about a day devoted to love that makes me love Valentine's Day. Ok, maybe it's because my birthday is the day after Valentine's Day, but I still love the candy hearts, valentines and cheesy/lovey-dovey things that occur on the 14th. 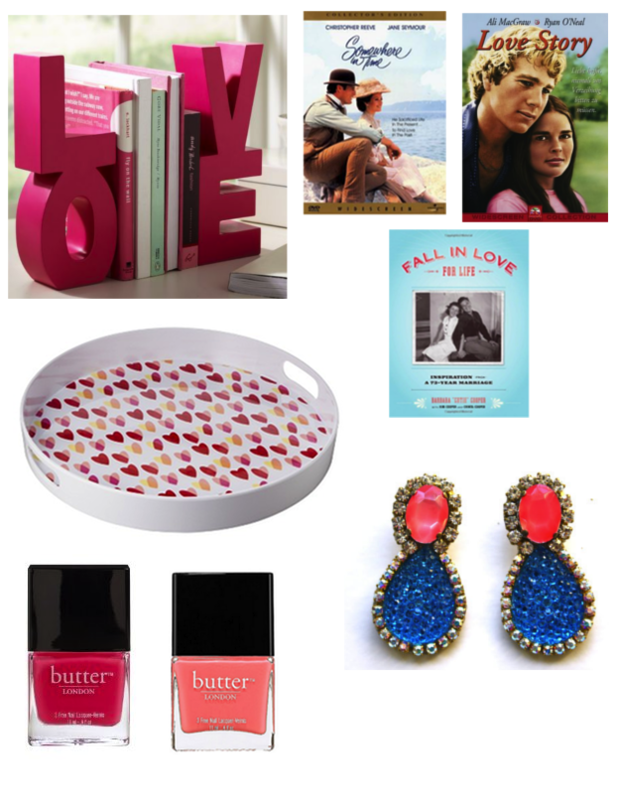 For all things devoted to sappy love stories, hearts and shades of red and pink, here are a few must-haves for V-Day. "Love" bookends: Sure, they may be from the kid's section of Pottery Barn, but what 20-something wouldn't want these holding her book collection together? "Somewhere in Time:" For anyone who hasn't seen this movie yet, run (do not walk!) to your nearest Target/Walmart/online Netflix subscription so you can watch this movie on Valentine's Day. You'll be swooning over Christopher Reeve's performance, and planning a trip to the Grand Hotel in Michigan, where the movie was filmed. "Love Story:" Another classic love story, it began the phrase, "Love means never having to say you're sorry." "Fall in Love for Life:" I originally saw this book in Anthropologie, and stood there for at least five minutes indulging in its first few pages. It tells the love story of a couple married for 73 years. Heart Tray: Use it as decor, or for a tray to serve fruity pink drinks on Valentine's Day. Butter London Nail Polish: Spending over $10 for nail polish is a little crazy, but these two colors are not only perfect for the 14th, they're also perfect for the spring! Doloris Petunia one-of-a-kind earrings: I have had my eye on many things from this Etsy shop since I saw this designer on Cupcakes and Cashmere, and these earrings are at the top of my list. those earrings, I need in my life. so cute! I love those Butter nail colors! I saw them in real life the other day and they are seriously drool worthy. I NEED those earrings! SO pretty! I'm obsessed with Love Story, such an amazing movie!! Then you HAVE to watch Somewhere in Time. It's even better! The book ends are adorable!